Home to the most advanced research, testing, and monitoring equipment in the packaging industry. Testing films for optimal performance, efficiency, cost savings and reduced product damage. Achieve load consistency, optimized standards, sustainability and maximum load integrity. Training on film properties and wrap patterns to achieve optimal stretch wrap application. Meet some of our experts and consultants across a wide range of fields here at Atlantic. Atlantic's patented programs and high level of expertise translate directly to value and performance for our customers. Preventative maintenance and repairs for your packaging equipment with our in-house technicians. 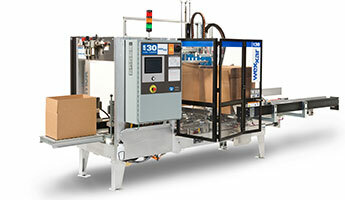 Complete packaging line integration to meet your demands for speed, accuracy and performance. Our CrownCare Service Program will help ensure long-term performance from your packaging machines. Saves money on materials by detecting the right amount of stretch wrap for each individual pallet. Atlantic’s engineering and service teams are an incredible source of value for your overall packaging operation. Comprehensive protective packaging solutions include analysis, demonstration, and implementation. Case erecting and sealing is often the first step in packaging line automation. Strapping systems ideal for your products, volume, and design of your full packaging line. Code Tech Thermal Inkjet (TIJ) Printers are compact, durable, and easy to install with no mess. Innovation and optimization are the cornerstones of the Atlantic stretch wrapping program. Expertise on films, equipment, and application to create a near zero down-time environment. The Atlantic team has 40 years experience with bagging equipment, barrier films and logistics. Rely on Atlantic for inventory control to free up production floor space and manage cash flow. High quality, dependable, and optimized packaging equipment is the cornerstone of what we can offer our customers. Robust printing and graphics for retail packaging from labels and cartons to inserts and shrink sleeves. Custom, full body packaging with 360° graphics to show off your brand and highlight unique selling points. Atlantic has passed rigorous testing to achieve quality certifications, including ISO 9001:2015 registration. Versatility in the breadth of paper products we can create and the range of industries we can serve. A microcosm of all the Atlantic branches under one roof in the Dominican Republic. Atlantic is the largest converter of bleached paperboard in North America. Find it all under one roof at Atlantic Packaging's state-of-the-art Printing and Graphics Facility in NC. Our goal is to help our customers be successful by creating efficiencies, cutting costs, and responding quickly to their needs. Atlantic was founded by Pulitzer Prize winning journalist, W. Horace Carter, in Tabor City, NC in 1946. The culture at Atlantic joins our people and our communities through events, team building, and volunteering. Atlantic invests in smart, experienced people who are dedicated to the success of every one of our customers. Take a deeper dive into packaging equipment, materials, and news about Atlantic with our Blog. Access our library of articles and resources to help you meet your packaging challenges. We have warehouse and branch locations in the U.S. and overseas to serve customers throughout North America. To exceed our customers' expectations in the performance of our products, the reliability of our service, and the integrity of our commitments. Copyright ©2019 Atlantic Packaging. All rights reserved.